The aluminum foil can be used to make the container, and it is very popular among the foil container manufacturing factory, and today we will introduce you this kind of aluminum foil, the thickness of it is usually 0.02-0.2 mm, the width is 100 mm-600 mm, and it is made of the material alloy 3003 and 8011, the container aluminum foil is used in many ways which superior to other substitute packaging product. 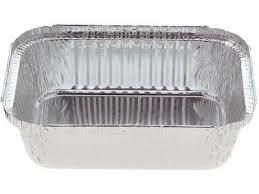 The aluminum foil container have reliable quantity ,reasonable price and prompt delivery,pass CEand ISO9001 :2000. Special sizes can be customized according to the requests of clients. The aluminum foil provided by the company is a big roll, the raw material for punched food container, and it is with very good performance. The aluminum containers are leak-resistant, sturdy, stackable, and keep foods fresher than plastic or styrofoam containers. Not only can aluminum containers be used in a microwave oven, they also stand up to conventional ovens and toaster ovens without melting, charring, or compromising the food’s original flavor. So the aluminum foil container is very popular, which promote the selling of the aluminum foil. The Haomei Industrial Co., Ltd has been engaged in the aluminum product manufacturing for more than 30 years, it has the mature manufacturing line and the excellent technology, the products have been sent to the countries all over the world, and the clients speak highly of the quality, it gains a worldwide appraises, so if you want to buy the high quality aluminum foil, you must find a reliable cooperator, if you have any demand for the container aluminum foil, you can contact us!